Glamour has got to be my most favorite! Sophie really knows me well when she suggested that I get these lashes. It fans out in a way that makes my eyes look longer and bigger. See how straight and aligned it is? And no messy glue to boot! Unfortunately, 3S Lashes are currently out of stock at Beauty and Minerals. Hopefully, Sophie stocks on these babies soon! And when she does, I'm so gunna fight you for these! 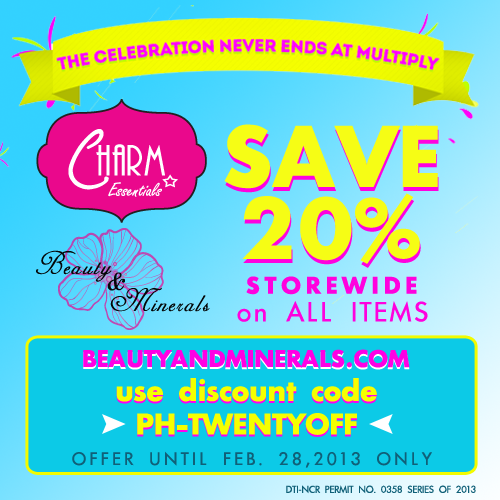 BTW, Beauty and Minerals is currently on SALE right now! I love it! Natural look, but it pops! Aaah. I'm totally in love with it! It really goes with your natural lashes. I like that it looks natural and it has fine lashes.